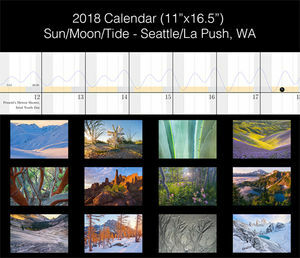 My 2014 calendars are in, and they look great! I will be shipping out all the pre-orders soon. If you have not yet ordered one, now is a good time since quantities are very limited (link on the right). At times, Seattle can feel slightly claustrophobic, particularly in November. The days are getting shorter, and the rain more frequent. It takes at least an hour to get out of the city, and then where to? Damp and dark forests await. Above them tower the Cascades, but the winter snows require extra care due to avalanche dangers and generally poor weather. Sometimes it can be hard to find the freedom that wild open places offer. A year from now I will be back in Southern California, at least for a short while. I’m looking forward to the countless backcountry roads, endless expanses of sand and rocks, and big starry skies. Last weekend I made a miniature escape from the city to the Seattle Arboretum, and stumbled upon a fascinating little scene. Unfortunately I’m sure many people will immediately think I applied some partial color filter to the image, however, the colors are entirely natural. The grass is black mondo grass (Ophiopogon planiscapus, and really is that dark and black! Both the grass, and maple from which the leaf came, are native to Japan. So perhaps there is a wild forest where such a moment could be found in the wild? 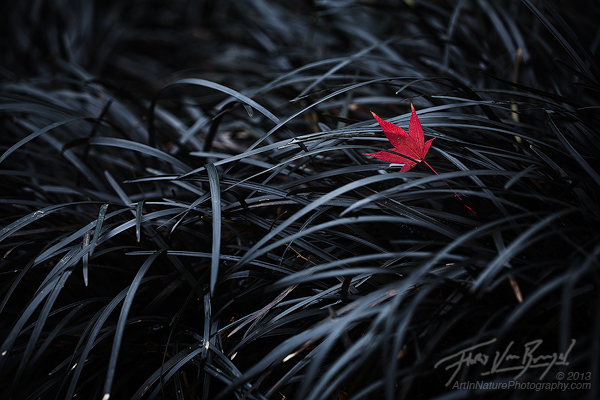 A Japanese maple leaf rests on a bed of black mondo grass (Ophiopogon planiscapus, also native to Japan). I found this little scene in Seattle’s arboretum.